Amid the bogs and forests of northern Alberta, in the heart of the Canadian oil patch, lie some of the largest waste dumps of the global energy business. In the shadow of the pipes and smokestacks that turn oil sands into flowing crude, earthen dams as long as 11 miles encircle lakes of toxic sludge, the byproduct of decades of extraction. These waste pools -- known as tailings ponds -- represent perhaps the most serious environmental challenge facing the oil-sands industry. Now, the battle over how quickly to clean them up -- and fears about who will pay -- are escalating anew. To howls from environmentalists, the provincial energy regulator granted two industry giants -- Suncor Energy Inc. (SU.TO) and Canadian Natural Resources Ltd. (CNQ.TO) -- approval for plans that could push a full cleanup decades into the future. Critics say the industry could end up sticking taxpayers with the bill, estimated at $27 billion. At issue is how, and by extension when, the ponds must be returned to a natural state. The industry is seeking more time to find cheaper ways to do the job. Environmentalists argue the problem has festered for half a century -- and the waste keeps piling up. Oil-sands companies dispute the notion they’re dragging their feet. Suncor is approaching the cleanup with urgency, investing “significant resources and capital,” spokeswoman Sneh Seetal said. With the help of improved technologies, the company now can treat three times the tailings it produces in a year, helping shrink the backlog that’s built up over decades, she added. 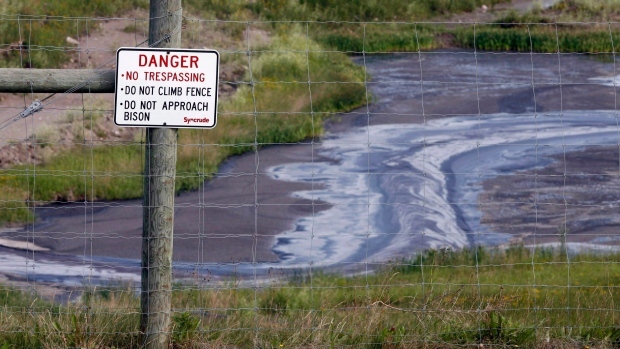 For decades, tailings -- a goopy mix of sand and chemicals -- have been pumped into ponds so the solids could settle. But settling has taken longer than engineers expected. Result: Alberta’s tailings ponds cover about 97 square miles and hold 340 billion gallons of waste. That’s enough to fill more than half a million Olympic-size swimming pools. 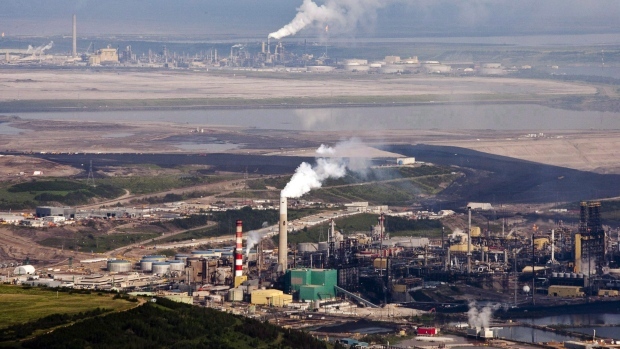 Still, provincial regulators estimate that cleaning up oil-sands facilities represents a $27 billion liability, of which the companies have posted only about $1 billion in security. Environmental groups say the cost could be much higher. The province also holds oil-sands assets against the liability. But McNeill says they are one of the highest-cost methods of producing crude, making them vulnerable to falling oil prices caused by a continued boom in American shale or the rapid adoption of electric cars.